Posted Sunday, April 8, 6:14 p.m. The GW baseball team snapped a three-game losing streak, taking the final two games of a three-game set with Xavier this weekend. 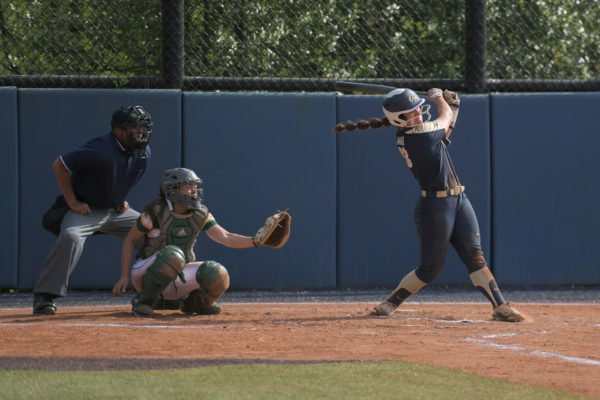 After blowing a lead and losing 4-3 in the first game of a doubleheader on Saturday, the Colonials offense awakened, winning the second game 7-4 and taking the final game 5-4 Sunday. The Colonials (32-16,12-6 Atlantic 10) have won five consecutive A-10 series and will look to clinch a spot in the A-10 championship next weekend when they host La Salle on Friday and Saturday at Barcroft Park. GW retains its one-game lead over Richmond in the A-10 West standings. On Sunday, the Colonials jumped out to a 5-1 lead over Xavier (18-29, 8-13 A-10) behind home runs from junior Tom Shanley and senior Ryan Roberson. Shanley hit a two-run homer during the Colonials’ three-run third inning. Wilkie allowed two runs to score in the bottom of the eighth inning, cutting GW’s lead to 5-3. In the ninth, the Colonials gave the ball to freshman Joel Brookens, who allowed the lead-off hitter to score but closed out the inning. Wilkie picked up his fourth win of the season while Brookens picked up his fourth save. On Saturday, the Colonials’ offense belted three home runs in a 7-4 victory. With GW up 4-2 in the sixth, junior Matt Owens hit a two-run homer to put the Colonials up by four. Roberson hit a solo home run to put the Colonials up 7-2 in the seventh. The Musketeers got two in the seventh, but it was not enough as GW won 7-4. Senior Dan Sullivan went six and two-thirds innings, allowing four runs while striking out seven. Brookens recorded one out for his third save of the season. Shanley was 1-for-3 with a solo home run and two runs scored. GW will look to sweep the season series from local rival George Mason Tuesday at 3 p.m. The Colonials took the first game 11-5 in April. GW has eight games remaining in their regular season schedule and will need to go undefeated to win 40 games in the regular season. Last season, the Colonials defeated Towson in the final game of the season to pick up their 40th win of the year. In 2002, the Colonials used five wins in the A-10 tournament to pick up 42 total wins on the year.